For so long I have wanted a mini display to go with my many Raspberry Pis and recently I got the PiTFT 3.5inch to go with the older Raspberry Pis I have and was searching for projects. I landed upon a project “Raspberry Pi PiTFT Weather Station” by Jamie Jackson and started implementing it. After using the weather display for few days, I did not find it much useful as maybe I am not that much into weather. At the same time when I was searching for projects for the PiTFT, I was also searching for ways to sound alarm at the 5 daily prayer times. This is when it clicked me to use the PiTFT to display prayer times. 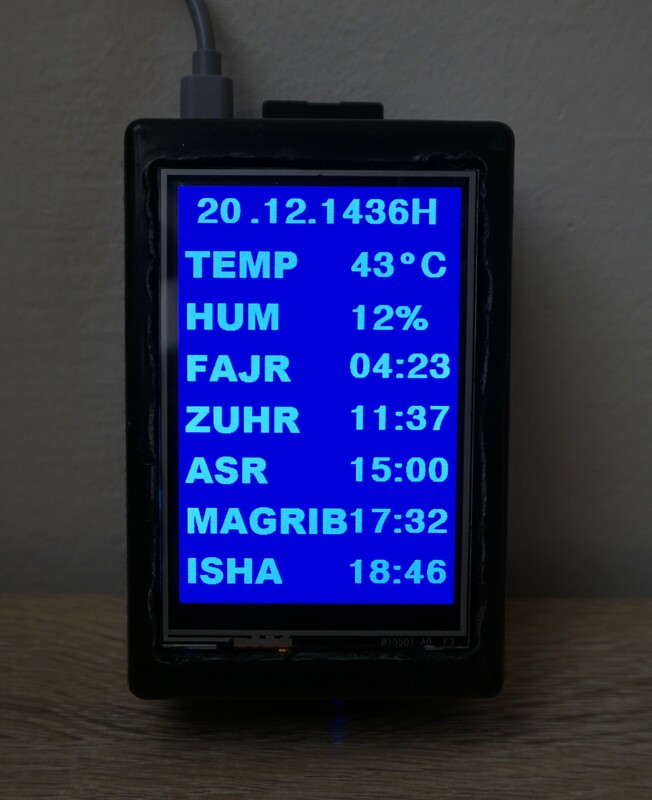 Since the timing for the 5 daily prayer changes every day and changes from location to location, I referred to “Turn your Raspberry Pi into an Azaan/Prayer clock” for the code. In this article, I will show you the procedure how I completed this project. There is lots of room for improvement in this project but I am limited to the knowledge I have of programming. For more information, you can refer to the links above.